1. The Destiny of America -- A " curious little book " entitled, Vindication of the True Art of Self Defense published in 1724 by Sir William Hope, Bart., a deputy governor of Edinburg Castle. The book is not of any particular note, but on the blank flyleaves is written in the hand of Sir William Hope an extraordinary prediction concerning the destiny of the United States of America. It was written, signed, and dated by an Englishman (no less) forty-four years before the beginning of the Revolutionary War. Today, this book can be found in the Congressional Library at Washington D.C. where it has been since 1879. The Destiny of American - Are you interested?? 2. Following closely on the unique destiny of America in world history, you will be interested to read the insightful commentary of Bearclaww's Interpretations (A Native American Indian's Interpretations) addressing 3 somewhat troubling and certainly alarming dreams Barak Obama includes in his book... "Dreams of My Father." 3. Information about the Lost Continent of Atlantis -- in particular, traditions from the Caribbean Island region, considered by some to be the location of the ancient Garden of Eden. It is theorized that it was sunk to prohibit access to the Tree of Life. By the way, which direction does it say that Adam and Eve were driven from the Garden? So which direction were they traveling?? Mene (1000), Mene (1000), Tekel (20), Upharsin -- Peres (half a Mene -- 500). 2520 years of what? (Or Daniel, chapter 4's seven time periods... 7 x 360 (360 days in old Jewish calendar) = 2520) Did someone say "bestial governments ruling"? It is interesting to note what happened 2520 years later... in 1917AD. That was the year when General Edmund Allenby marched into Palestine under the British Mandate to take back the city of Jerusalem. Wow! The General sure got lucky that year... hitting the date right on! Visit KEHILA NEWS ISRAEL for more history on the Balfour Mandate. By the way, that last bestial government is still around today. It's just their ruthless, wild and animalistic tendencies have learned how to keep off the radar and hide. Compare the land size of Israel - with other nations. Israel is even smaller than some of the counties in California. And ask yourself, why do at least 1/3rd of all United Nations resolutions: annually condemn, censure or deplore the state of Israel... with hardly a resolution or even a peep... against any state or faction who opposes Israel's sovereign right to exist? 1 The burden of the word of the Lord for Israel, saith the Lord, which stretcheth forth the heavens, and layeth the foundation of the earth (so that's the Creator...), and formeth the spirit of man within him. 2 Behold, I will make Jerusalem a cup of trembling unto all the people round about (so that's the peoples and nations in the neighborhood of that city...), when they shall be in the siege both against Judah (that's the Jewish people...) and against Jerusalem (the capitol of those Jewish people from ancient times - circa 1,000 BC...). 3 And in that day... (and that's the Day of Vengeance/ the Day of great Tribulation...) will I make Jerusalem a burdensome stone for all people: all that burden themselves with it shall be cut in pieces, though all the people of the earth (and I'd guess, since that isn't the UN... but the whole earth, then, certainly these words include the UN, too!...) be gathered together against it. To the people of God, it's exciting. The Lord said, When some generation finally sees these things come to be, Look up! The Redeemer is near! Check out the following video. Though what you see shouldn't be surprising, what you learn from the compiled public policy agenda quotes might be offensive, particularly since you sense them to all be telling truth. Title: The Dark Intentions of Public Schooling Description: This video quotes major experts, sources, and observers of the American educational system. Additionally, I'm looking for information regarding traditions and legends of Joshua's Longest Day and the many North and South American Indian legends of the Longest Night (after all, can't have one without the other, right???!). And... along these lines, here's a rather simple question with a surprisingly complicated answer: Has the Sun always risen in the East? (By the way, for scientific purists demanding accuracy... most of us technologically advanced folk know that the Sun doesn't rise, the Earth rotates... yet we still describe the process using that phrase.) So... has the Sun always risen in the East? NO... it hasn't!! At least according to John White who wrote Pole Shift back in 1980 in which he supplies ample evidence citing various civilzations in Central and South America as well as in Africa which possess what are believed to be enormously intricate Sun-dials. The problem is that though they are identical to other antiquated yet functional Sun-dials... some of them are curiously mis-directed to a different angle. Notice I did not say: different angleS. Therefore they serve no practical purpose for us today (or for those during the last several thousand years). Yet these Sun-dials suggest purposeful intention and with recent paleological findings seem to parallel the studies revealing palm trees beneath the frozen tundra in both Alaska and Greenland (a curious name for the most ice covered land mass in the Artic circle) as well as uncovering wooly mammoth still chomping on forage found in the northern regions of frozen Siberia. Hardly the place you'd expect for tropical baby mammals to wander off to. So.. has the Sun always risen in the East?! I don't know. I left my camera home... and can only rely on the evidence the experts dig (not cook...) up. 7. In all my years of education from elementary and secondary experiences through post-graduate studies, it was not until I got OUT of school that I learned about ancient mariner cartography. Now as an educator, this is particularly curious to me especially since I love studying the history of civilizations, the stories of inventions, geography, oceanography, astronomy… and any thing about any where man can travel (if only in his dreams). It has only been in recent years and with the seeming reckless encouragement of Dr. Gene Scott… to as many of us who dare to continue learning and never stop… that I stumbled on to this captivating yet half-buried topic: Ancient Maps. 8. Being a protestant at heart (the movement having been birthed in those whose lives founded the Reformation... John Wycliff of England, 1300s; Martin Luther of Germany, 1500s; John Calvin of Switzerland, 1500s... as well as John Knox of Scotland, Ulrich Zwingli of Switerland... and so many more.... This link takes you to Reformation and counter-reformation commentary and discusson links. 10. Along with Dr. Karenga, California State University professor and originator of Kawanza celebrations back in the 60s and a Virtual Jerusalem "Chanukah" website, my "Christmas or Saturnalia?" 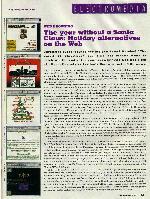 file was referenced in a WEB BROWSINGS article entitled: "The year without a Santa Claus: Holiday alternatives on the Web" on page 87 in the December 1998 issue of CMJ magazine -- the one with Marilyn Manson on the cover. That's sorta cool! Even the comment to those whose Christmas tastes "run a little... spicier" and that my Holiday file "has some entertaining history of the rival celebrations" though "my overly jocular-jabs... can be a little irritating" especially coming from these alternative rock folks who often can be extremely irritating to some... I take as a complement. I wonder: Does that mean I may have even irritated the author of this festive article? I don't know. More Wonders! Your help with links to any of these subjects is greatly appreciated. Please e-mail me!